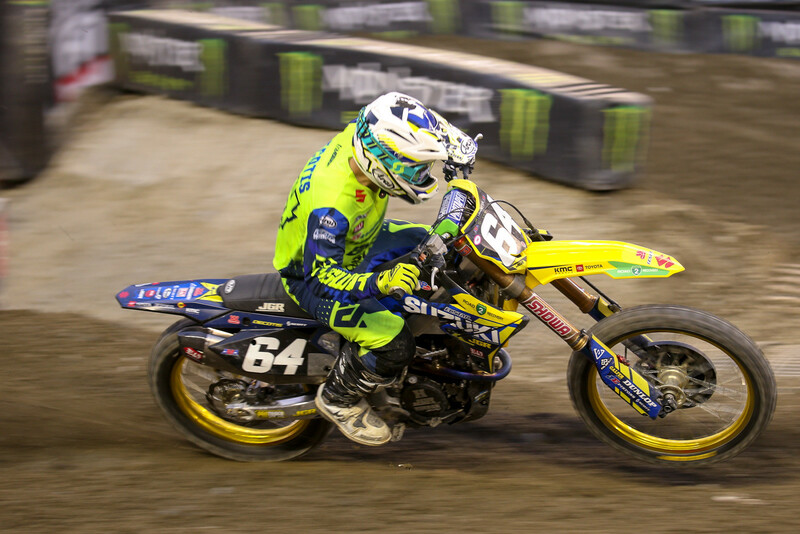 It has been a long time coming for Dylan Ferrandis, but he was finally able to secure the first win of his Supercross career in Seattle. He has been close many times and honestly if he hadn't gotten hurt last year he probably would already have one under his belt. But that doesn't matter now since he has actually done it. This win comes at a an important time in the championship, too. Adam Cianciarulo is going to be in the top three at each race until the end of the season unless he crashes, so there is no more wiggle room for Dylan. He has to finish in front of Adam at pretty much every race from here on out if he wants to win the title, and that means he's going to have to win more. I think he can do it if he is consistently up front at the start of each Main Event, but that has been his Achilles heel all season long. There's a 12-point gap between Dylan and Adam. It'll be very interesting to see how this pans out, especially since the 250 East series has become a one horse race. After a terrible day in Atlanta, Jimmy bounced back in a big way in Seattle. 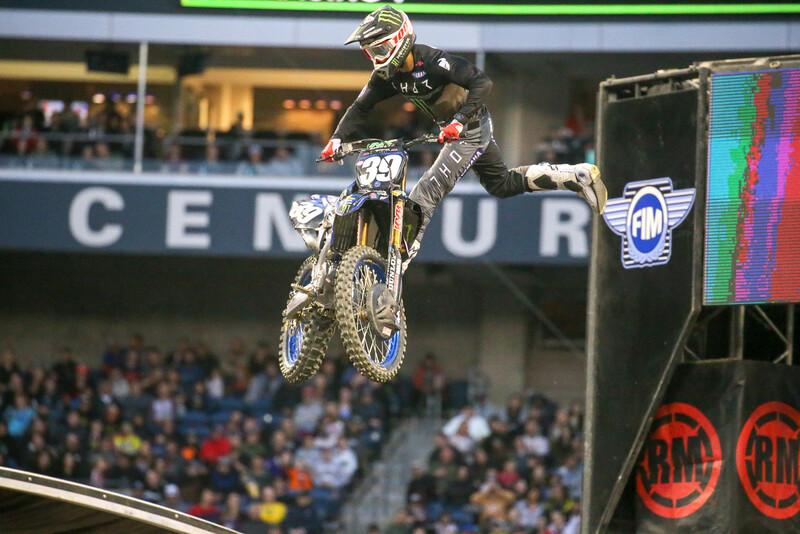 He looked strong in the whoops all day long, which might surprise some folks given his height. But it is a strength of his, and he put it to his full advantage until they became jumpers during the Main Event. Even then, his speed was great and he was able to hold off Michael Mosiman late in the race for his second podium of the year. With how well Dylan and Adam are riding, I don't think Jimmy is going to win a race unless something crazy happens, but I could see him grabbing another podium or two before the end of the season. And really, it was a solid bounce-back round for JGR in general, as Enzo Lopes finished in ninth. I'm glad to see the team have a good weekend after what has been a challenging season at times. The 250 West series has not been great for GEICO Honda. This is a team that is expected to contend for the title, but they have yet to land on the podium this year with either of their riders. RJ Hampshire started off the season looking strong with multiple fourth place finishes in a row, but since then his finishes have largely been hampered by bad starts and crashes. He actually started around last in Seattle and came back to sixth place, which isn't bad at all, but it doesn't change the fact that the West part of the season has been rather disappointing for the team. I'm sure they expected RJ to finish on the podium by now. Cameron McAdoo was brought on as a fill-in for Christian Craig and has done fairly well, although I'd argue that he has more potential than what he has shown this season. Hopefully, RJ or Cameron can get on the box at least once for the team before the season comes to an end. The final nail in the coffin of Colt Nichols' championship hopes came in Seattle. 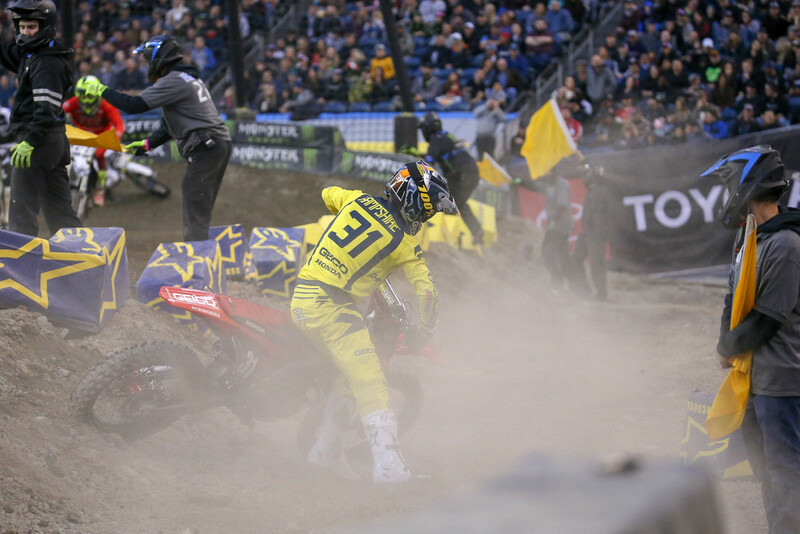 It's hard not to feel bad when everything just seems to fall apart for a rider who did so well early on in the series, but it's been quite rough for Colt ever since the mud race in San Diego. That was the turning point for him as it was his first finish off of the podium, and then he got a seventh in the East/West Shootout which hurt even more, and then Seattle happened. He put himself in a great position off of the start and it was the perfect opportunity for him to straight-up beat Adam and Dylan and take back some points, but then he came up short towards the end of one of the rhythm sections and that was all she wrote. He was done for the night. He posted on Instagram that he's physically okay except for a laceration on his thigh, which is great news considering it looked like it could have been much worse. However, I'm sure he's disappointed to see that he is now fourth in the standings...43 points down from Adam Cianciarulo. At this point, all he probably cares about is individual race wins and podiums, and I'd bet he gets back up on the podium soon. This was a great result for Ken, considering how the past couple of weeks have gone for him. He was asked about the condition of his body several times throughout the day, and he said he doesn't know what has been making him feel tired lately. He had the flu at one point, but this goes far past any sort of post-flu fatigue that I've ever heard of, so I'm guessing they think it's something else. No one will really know until he gets some tests done (which I believe he will be getting this week), and then we still may not know unless he discusses the results of the tests. But, regardless of his condition, he was able to get through the entire Main Event while running a solid race pace and came home with another second-place finish. We all want to see him win, but in many ways, this second place was a win for him, and it should provide him with some confidence heading into Houston. Well, Marvin technically claimed his second win of the season on a track that I wouldn't normally peg him as the favorite to win. Tough whoops usually foreshadow a rough night for the Frenchman, but the track crew took them down a few notches from where they were early in the day, and eventually it became more of an option section. Each rider could either blitz or jump through the whoops by the time the Main Event rolled around. Blitzing was faster, assuming that the rider didn't lose his momentum about halfway through the whoops, while tripling through was more consistent and only a tad slower. Marvin took advantage of the jump option through the whoops and also looked to be flowing fairly well through the rest of the track. It wasn't a surprise to see him hold off Ken Roczen and take the win. However, it was revealed about halfway through the race that Marvin had jumped through an entire section while a red cross flag was out. That meant he was going to get penalized, and would not be walking away with a full 26-point victory at the end of the night. After reviewing the incident, the officials docked him seven points, but the kicker was that he got to keep the win. Of course, this wasn't just some off-the-cuff call, as the rulebook does call for points to be taken away but not the win. So Marvin got to celebrate the win even if he only earned the same amount of points as fourth place. I think that in terms of convenience this rule makes sense. There are fewer logistics involved in just stripping points away instead of the win, but overall I don't agree with this rule. I didn't agree when it was applied to Jeremy Martin last year, either. I think that it should be a position penalty. That's what makes the most sense, and that's what requires the least amount of explanation. He jumped through a section while a red cross flag was out but he ended up winning? Penalize him two or three spots and be done with it. Some of the official decisions in this sport seem unnecessarily rash or overly-complicated. Also, this doesn't make Marvin a cheater like a lot of people have been calling him. He made a mistake and jumped through the section during a red cross flag situation. He's not the first to do it and he won't be the last. Riders make mistakes; they're not robots. Unless I missed something, there was never even a mention of Justin Barcia during the broadcast of the race. As far as I can tell, he got a bad start and then either crashed or had to go into the mechanic's area. He was then in 21st and could only get back to 17th place by the end of the race. He'll be looking to have a better result in Houston. Justin Brayton and Chad Reed were both involved in an extremely scary crash at the beginning of the Main Event that left both riders injured. Chad hooked up with Ryan Breece in one of the first rhythm sections and took Justin with them. Justin got absolutely launched towards the sky before landing on the floor of the stadium, while Chad got landed on by Kyle Chisholm. This was just an unfortunate racing incident that left Justin with an MCL injury (that won't require surgery), and a sprained ACL in his left knee. Chad scored eight broken ribs, a broken scapula and a collapsed lung...along with some injuries to spinal processes. What a freaking bummer. I hope both of them are back behind the gate next year. Exactly..... Stop knocking down the whoops for the KTM Guys. The whoops are supposed to separate the riders. Leave the whoops big and then we will have a tight race! 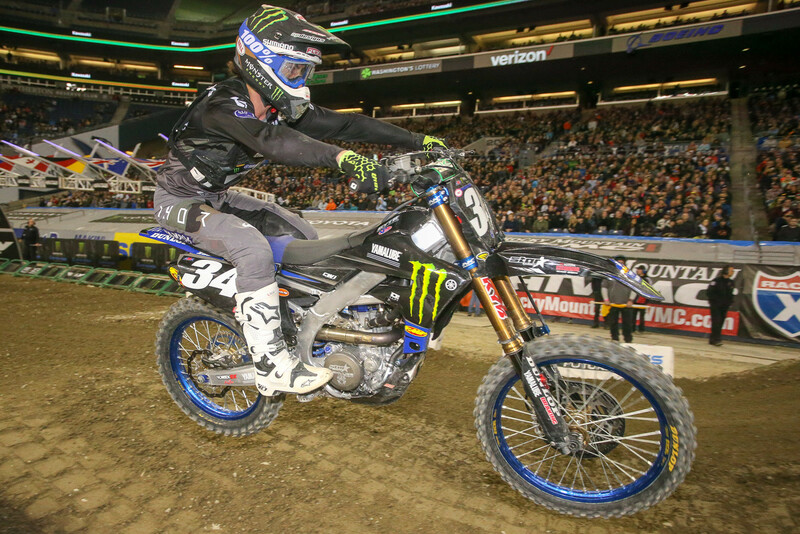 What happened to whoops this year? Whoops have always been a staple of supercross. So because Marvin and cooper can’t blitz whoops the track crew builds rythem sections only. Common now, let’s see some whoops , some tuff deep blitz only whoops that actually challenges these guys. Chris Blose - This guy just keeps impressing in the 250 class this season. Not only did he get fifth place, but he came from 16th to get it. I’ve maintained for a while that while he has been performing well I didn’t think he’d be able to get any sort of factory supported ride due to his age, but some teams might want to take a look at signing him up for next season. Shane McElrath - It sounds like he hurt his back a couple of weeks ago and is still dealing with some pain from it. In an Instagram post he also stated that he’ll have to take some time off, so I’m guessing he’ll be out for most of the rest of the season, if not all of it. It seems like some people think he’s not actually injured at all and that he’s doing this so that he doesn’t point out of the 250 class. And while it is impossible to ignore that this will keep him from doing so, I don’t think that this is a made up injury to help him stay in the class. I believe him and the team when they say he is hurt, but I am also not surprised that they’re not putting too much pressure on him to push through it as that would lead to him pointing out. I hope we see Shane back before the end oft he season. Michael Mosiman - Look at this kid! He finally broke into the top five and he wasn’t far off from passing Jimmy Decotis for the first podium of his career. This is the kind of result that I think Rockstar Energy Husqvarna was hoping Michael would bring to the table this year. Now, it’s time for him to do it again. Gage Schehr - It’s rough whenever a privateer goes down hard and sustains a laundry list of serious injuries. Guys like Gage still go out and race because it’s what they love to do, and it’s obvious it’s not about making boat loads of money for them. The latest on Gage is that he suffered a lacerated kidney and liver, five fractures in his spine, collapsed lungs, a broken arm, a damaged artery, and eight broken ribs. He is in stable condition. Please keep him in your thoughts. Josh Grant - I understand he came off of the couch and only rode for a few days before Seattle, but I’d imagine both him and the team assumed that he would make the Main Event. So I’d chalk this up to a disappointing return for Josh. However, he clearly does have the speed to be in the Main Event and now that he got some of the nerves out of the way I expect to see him in every Main Event from here on out. Dean Wilson - Deano was really just hammering the whoops all day and he was gaining quite a bit of time on guys when he could get a decent entry into them. Sixth place was a nice finish for him after he’s been hanging around eighth and ninth place for a while now. He still stands sixth in points, too, and I hope this helps him land a full-time factory ride for next year. I don’t doubt that McElrath is hurt, but if points were not an issue I bet he would push through the pain. With that said I don’t blame him at all, even if he isn’t hurt I would do whatever kept me employed.